Preheat oven to 400 degrees. Cut the squash in half lengthwise and scoop out the seeds from each half with a large spoon. Brush all of the cut surfaces very lightly with olive oil. Place the squash halves (cut side up) on a large baking sheet and cook for about 90 minutes. While the squash is cooking, peel the potato/es and cut them into 2-inch pieces. Next, put them in a small saucepan and add enough cold water to cover them, then sprinkle in about 1 tsp. kosher salt. Bring them to a boil over high heat and cook until they are fork tender. Drain them and set aside, reserving the cooking water. When squash is done, let it cool enough to handle and gently remove the skin by pulling it off. Also cut off any burned or hardened edges. Some light browning is OK and gives good flavor, so you can leave that, but you just want to remove anything really crunchy or blackened. Set the squash aside. 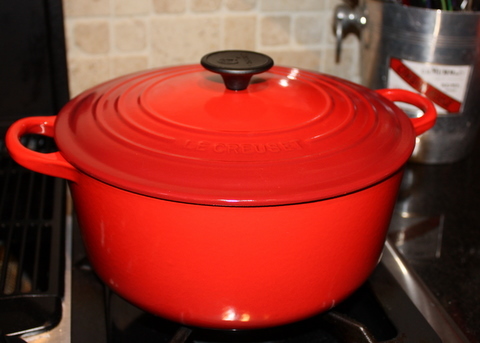 In a large stockpot (or French/Dutch oven), heat the remaining olive oil until it starts to just barely shimmer. Add the onions and saute over medium heat until they are softened and translucent. Add the garlic and continue to saute for one more minute, stirring constantly. Carefully (it may sputter) pour in the wine or vermouth, stirring the deglaze the pan. Add the cooked squash and potato and stir to coat the veggie pieces with the wine/onion mixture. Stir in 3 cups of the veggie broth and the can of coconut milk. Stir in 1 1/2 teaspoons of the curry powder. Puree the soup with an immersion blender*, starting at the lowest setting and working up to the medium setting, making sure to puree any lumps. Taste the soup and add more curry powder, if necessary, and/or more vegetable stock, if necessary, to reach the desired consistency. If you need even more liquid to reach the right consistency, add the reserved potato cooking water. Taste the soup again and add kosher salt and white pepper to taste. * If you don’t have an immersion blender, you can puree the soup, in batches, in a food processor, blender or food mill and then return it to the pot for final seasoning. Garnish with finely chopped fresh cilantro, if desired. 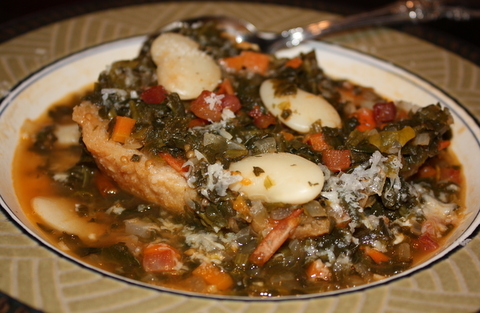 This is a REALLY delicious soup, but is VERY filling and this recipe makes a LOT. I haven’t tried to freeze it yet, but I’d bet it would freeze nicely. 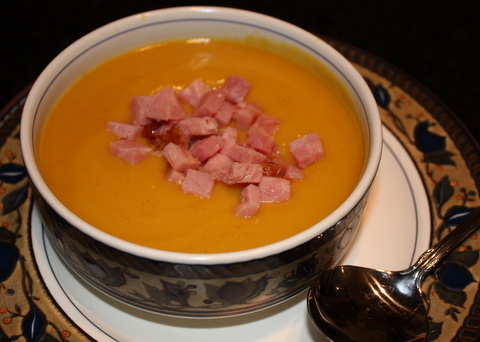 If you have a little leftover New Year’s ham, you could sprinkle some diced ham over the top of the soup to make any carnivores at your house happy. Or maybe a little leftover roasted or grilled chicken, but it’s not necessary. It’s plenty tasty on its own. Nota bene: I used 1 tsp. of Penzey’s sweet curry powder and 1 tsp. 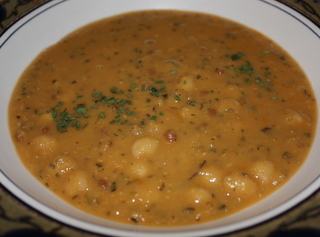 Penzey’s hot curry powder in our version of this soup and it was perfect for us. Not too spicy, but plenty flavorful. Since curry preference is pretty subjective, feel free to add more or less to suit your own taste…just start out with a little, ’cause you can always add more, but can’t remove it, once it’s in. 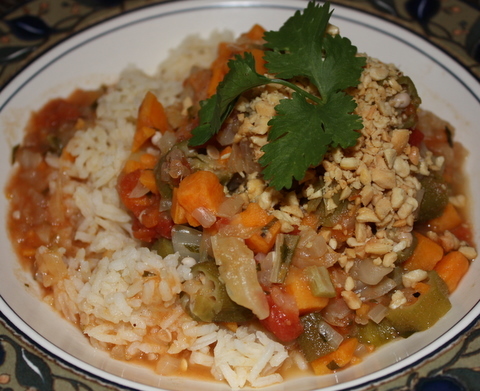 Another recipe from Madhur Jaffrey’s World Vegetarian book. 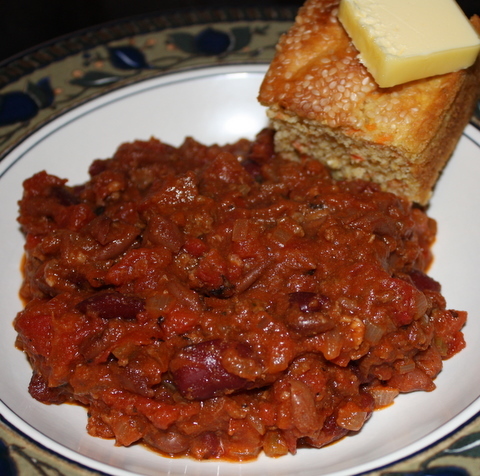 I can’t find a link to this recipe online, but it’s basically just a vegetarian chili with kidney beans (I used borlotti, which are more pinto-ish, because I already had some soaked and cooked,) served over polenta which has a bit of butter and parmesan cheese added to it. Very yummy dish, but I do feel a little embarassed, as a Texan, to call this “Tex-Mex Chili.” I mean, really…there were no Fritos or onions or grated orange cheese over the top of it. And, HELLO??? There was NO MEAT! And there were LENTILS in it!!! 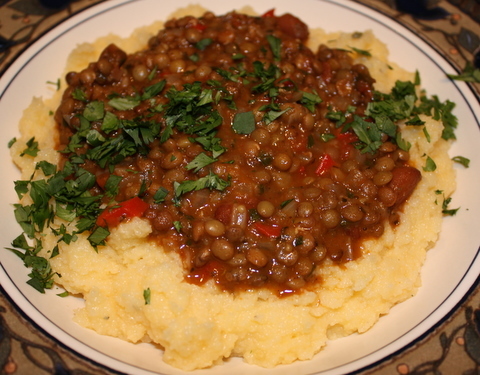 It was good, but this really should be called polenta topped with bean stew or something. I will make this again (with the polenta subbing for the Fritos, it’s kind of an upscale Frito pie,) but will probably adapt my own vegetarian chili recipe to use more Tex-Mex spices and maybe add some textured vegetable protein, to at least make you FEEL like there could be meat in it. I like the combo of polenta and chili, though. Creamy and soft, mixed with warm and spicy. I have a confession to make. I’ve been keeping something from you. I haven’t told you about Bernard. Bernard has been living with me for a few months now. He is exceedingly attractive, but is also highly adaptable and a very hard worker. He must be tenderly cared for, but is able to withstand very heavy duty. We’ve enjoyed each others’ company immensely. We’ve been doing lots of cooking together. Hubby has learned to tolerate Bernard, but he’s not as enamored with him as I am. I, for instance, am the only person allowed to “bathe” Bernard. Bernard and I met at a charming little shop called Sur la Table. A customer-service glitch caused me to be offered a one-time 25% off discount, which enabled Bernard to be able to come home with me. We have joyfully welcomed him into our home and are eager to tackle many future projects with him. 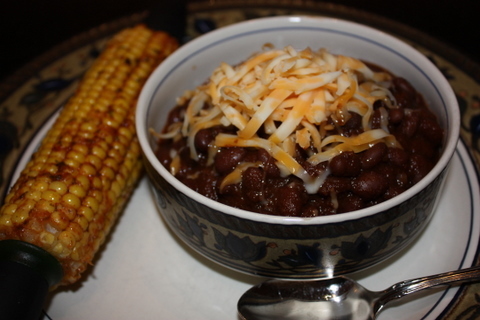 So, after I brought Bernard home, the first thing that we tackled together was this Black Bean Chili. This was one of my mother’s recipes and I have NO IDEA where it came from, so please forgive my potential plagiarism. Cover beans with fresh water in a very large pot and bring to a boil with the bay leaf. Lower heat and simmer. Heat a medium-sized heavy skillet. Add cumin seeds and saute until toasted. Add oregano, stirring frequently. Remove from heat, then add paprika and cayenne. Stir, remove from pan and grind to a coarse powder in a (spice-dedicated) spice or coffee mill (or with a mortar and pestle.) Heat oil in a large skillet and saute the onions until softened and translucent Add the garlic, salt, ground herbs and spices and chili powder and cook for 5 minutes. Add the tomatoes, juice and 1 teaspoon of the chipotle. Simmer for 15 minutes. Add the mixture to the beans and add water, if necessary, to cover beans with liquid by one inch. Cook until beans have softened to your desired consistency (about one hour?) Stir in more chipotle (if desired,) vinegar and cilantro. Serve topped with cheese or sour cream and more chopped cilantro. Chili-Lime Corn on the Cob recipe here. Every recipe I’ve ever had that has called for chipotles has called for one or maybe two, yet there are probably a dozen of them in the average can (plus all of that wonderful adobo sauce!) How to solve this issue? After you open a can, pull the remaining chipotles out of the can gently with a fork and place them an inch or two apart on a wax paper-lined baking sheet and freeze them. I dollop the remaining sauce from the can onto the top of each chipotle before freezing, too, so each one will have plenty of that saucy goodness on it. When the chipotles have frozen solid (overnight?,) gently peel them off the waxed paper and place them in a ziploc bag and freeze them until needed. You can more easily pull them out, on at a time, in the future that way. This recipe is pretty good, but doesn’t really have enough “oomph,” for my taste, for it to be something that I would make again on a regular basis. It is, however, the PERFECT thing to make for a family member that has been sick or is recovering from a cold, flu, etc. I know that’s not terribly exciting, but it is good to have a few recipes like that in your arsenal. You could spice it up and make it more palatable for someone who isn’t infirm, but that kind of goes against the nature of it, I think. 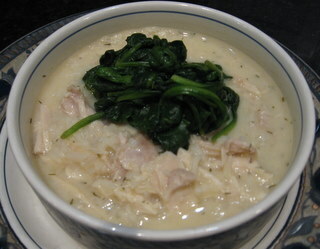 It’s a simple, good, tasty chicken and rice soup. It would be great for small children on a cold day. Not fancy, just basic.